Spencer Rigging provide visual riggging inspections to ensure safety, longevity and effectiveness of your rigging and to satisfy insurance requirements. We inspect all running and standing rigging including all termination points and associated hardware such as Blocks, spreaders, furlers and headsail foils. We provide a detailed report of our findings, including reccommendations for any additional parts and work required. 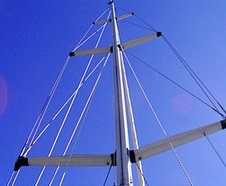 Spencer Rigging also undertake repairs and modifications of masts and spars click HERE for more information. To find out more or to book your inspection Contact Us.